Its that time when we have to start preparing for Christmas. As you will appreciate, lots of planning needs doing to ensure we have the meat available for that one day! We do very much appreciate early orders as this helps us gauge early how much meat to have in the butchery. Also curing hams and bacon is a longer process so advance notice is greatly appreciated. Here is our Christmas Order form. Please fill out and return to the butchery or email to david@rosegatefarm.co.uk. We will be selling Turkeys (reared locally), Goose, Chicken, our own beef, pork and lamb, sausages, bacon, gammon, stuffing etc. Let us know if you want something that doesn’t appear on the order form and we will endeavour to meet your requirements. Located on Rose and Crown Road, Swavesey, Ben and Lydia Baker and family at Rosegate Farm are well known locally, having produced raspberries and strawberries here for over 50 years. We are passionate about sustainable farming – low food miles and selling to the local community were part of our business from the very beginning. In 2010 the youngest member of the family, David, joined the family business and began rearing traditional breed pigs, sheep and cattle to expand the range of fresh local food available to our customers. Our fresh meat proved so popular that in 2011 we built a butchery on the farm so that we can provide our customers with the exact cuts of meat they require. People tell us they appreciate the flavour, freshness and quality of our home grown, farm fresh produce. Building on the principle that happy animals result in tasty produce, we ensure that all our animals are kept to the highest standards of welfare. Our delicious strawberries and raspberries are all grown here on the farm, picked daily to ensure they are fresh and ready to eat. Usually the strawberry season extends from the middle of May through until October. Freshly picked strawberries are available from the farm throughout this period and we are open for “Pick Your Own” on Saturdays throughout June. Please check the latest news section of the website for more details of ‘PYO’ dates. Freshly picked raspberries usually become available in early June and are here through until September. Larger quantities of both strawberries and raspberries are usually available for functions/jam/freezing although we highly recommend giving us at least a weeks notice so we can be sure we can cater for your exact order. Plums are also usually available during August. 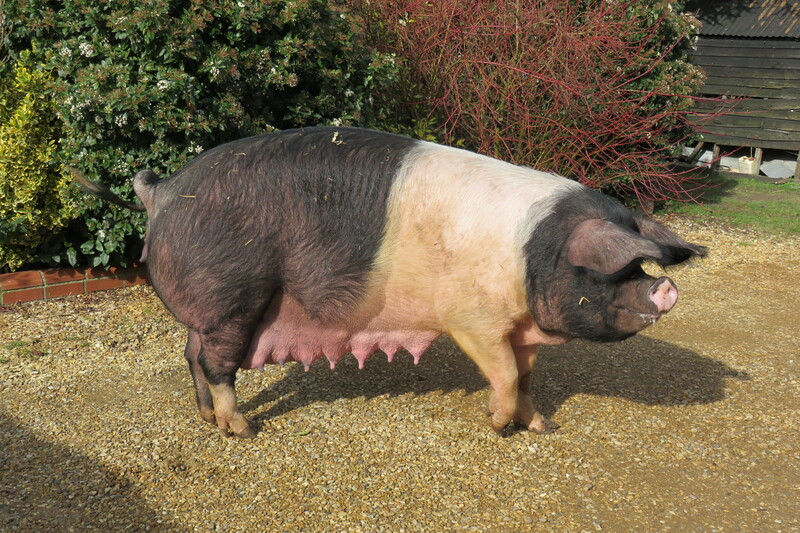 All our pork, sausages, bacon and gammon come from traditional breed pigs raised here at Rosegate Farm. Always check the “latest” section of our website to find out when the next batch will be available! We currently have a mix of Hampshire, Large White and Oxford Sandy and Black pigs, chosen for their flavour and quality lean meat. Our pigs enjoy the most natural life we can give them, spending the summer rooting around the orchards, especially enjoying windfall plums and apples. They then move inside to spacious, straw bedded pens for the winter for protection from the coldest weather. We transport the pigs ourselves to a small local abattoir, before collecting the meat ready for it to be butchered, cured or turned into sausages here at the farm! The beef available from the Rosegate Farm butchery comes primarily from our own herd. As demand for quality local beef has been so high we occasionally buy in beef animals from 2 other farms we work closely with whilst building up our own herd as quickly as we can. Our aim is that before long all the beef we sell will have been born and reared on the farm, but building up a high quality herd capable of meeting demand takes time! The beef is all either Hereford, Aberdeen Angus or a Hereford/Angus cross, both breeds are known for their fantastic quality beef. Our beef cattle spend the summer months grazing traditional pastures in and around the village, coming into barns on the farm through the worst of the winter weather and eating our own hay, silage and straw. We transport them ourselves to the abattoir, giving the animal the best treatment we can to minimise stress. The beef is then hung for at least 21 days in our butchery on the farm before it becomes available directly to you for the perfect weekend roast! The lamb available from the Rosegate Farm butchery comes from our own flock of sheep or from a neighbouring flock in Swavesey. Reared in Swavesey our lambs graze pastures in and around the village. In the winter their diet is supplemented with our own hay, straw and barley. As with our pigs and cattle we transport the lambs to the abattoir, before butchering them ourselves back at the farm. So whether your preference is for a simple chop or a rack-of-lamb please let us know and we will do our best to cater for your tastes! …and becomes a mum the next day! traffic jam on Rose & Crown Road! An orphan lamb wanted a fuss! You can now make savings in time and money (not to mention the added convenience) on the way you buy your lamb from us by ordering one of our lamb packs. These are available as quarter, half or whole lamb. We are willing to tailor your pack to suit your family’s requirements within the constraints of pack size. We have listed below the typical contents of each pack to give you an idea of what you might receive. To place an order for a pack please phone or email us using the details above. Take junction 28 (the Cambridge services junction) signposted Swavesey. Follow the road until you enter the village. Take the first left, Rose and Crown Road, signposted Fen Drayton. After approximately 200m you will see Rosegate Farm on your right. Please drive into the yard, there is plenty of parking! Click on the map to get directions from Google Maps. Our farm shop is open all year round, Monday – Saturday, 8.00am – 6.00pm, so why not drop by and try some quality local produce for yourself! Here at BJ Baker and Son we are committed to respecting and protecting your privacy. The policy relates to all our business activities, not just the website. This policy may be updated from time to time so please check this page occasionally to ensure you are happy with the changes. By using our services you are agreeing to be bound by this policy. We are B J Baker and Son, trading as Rosegate Farm and Butchery. We retail fresh meat and soft fruits to local customers from our shop on our farm. We collect information from you when you contact us to enquire about our services either in person, by email, social media or by phone. We collect information to enable to fulfil our obligations to you our customer, and to respond to business enquiries. The table below details exactly what information we collect, and for what purpose. By filling out our web signup for the mailing list you are consenting to receive a weekly email newsletter as well as any other special offers. If you decide you do not wish to continue receiving our newsletter you may use the unsubscribe function at the bottom of the newsletters or alternatively email us at david@rosegatefarm.co.uk. As o f25th May only subscribers who have double opted in will continue to receive our mailing list. In order to double opt in, customers must fill out the header banner on their email to reconfirm their consent to receive the mailing newsletter. We do not gather sensitive personal data (e.g. health, genetic, biometric data, racial or ethnic origin, political opinions, religious or philosophical beliefs, trade union membership, sexual orientation, and criminal convictions). We have no need for this information and expressly request that you do not provide such sensitive data to us. Our services are not directed at children under 13. If you learn that a child under 13 has provided us with personal information without consent, please contact us. We may pass your information to third party service providers who we have engaged for the purpose of providing services to you on our behalf. We disclose on the information necessary to deliver the service. We have signed model contract clauses Until request for deletion. Subscribers can unsubscribe at any time. You may request a copy of any data that we hold about you. Upon request we will provide an electronic version containing all the information that we hold on record about you. The accuracy of your information is important to us. If you change your email address, or any other information we hold is inaccurate or out of date, please contact us so can correct our records. The cookies we use are 1st party cookies. We don’t use any 3rd party cookies (these are often used to track behaviours across a range of websites, so targeted advertising can then be applied. We don’t do this!! By using and browsing the Rosegate Farm website, you consent to cookies being used in accordance with this policy. If you don’t consent, you will need to turn off cookies or refrain from using the site. Most browsers will allow you to turn off cookies. Switching off the cookies should not noticeably restrict your use of the website. Password Protection – All accounts on PC’s, laptops, mobile devices connected to Rosegate Farm are password protected. Security – concerning devices (PC’s, laptops, and mobile devices), online accounts, physical access and storage. Rosegate Farm, 36 Rose and Crown Rd, Swavesey, Cambridge CB24 4RB.